and services to keep Agtegra Country running without interruption. We help our customers make informed energy decisions carefully sized to their needs. We've got your fuel covered to take you where you're going. Stop by one of our convenient Agtegra fuel locations to fill up. 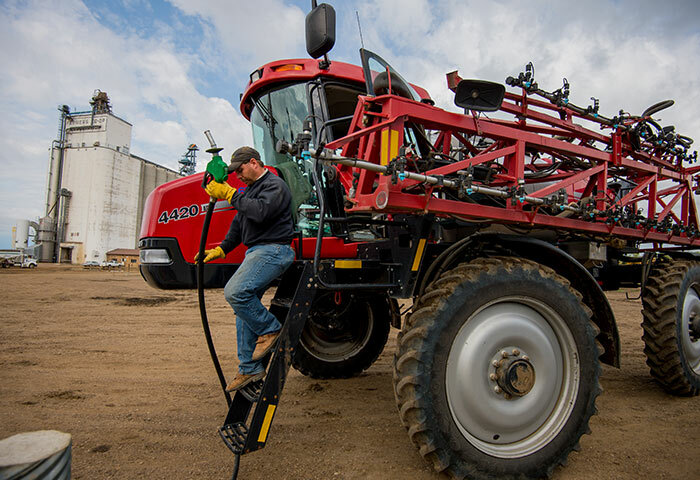 There are several ways you can get started with Agtegra Fuel. Your local Agtegra location can help, ask your Sales Agronomist for information and recommendations, or contact the Fuel Department in the Aberdeen office. The Agtegra Fuel business provides petroleum and energy products and services to keep Agtegra Country running without interruption. Convenience and customer service are the hallmarks of our commitment to serve our customers. We offer several fuel options, from diesel fuel and gas blends to propane. You can buy your fuel in bulk, arrange for automatic delivery, or fill your vehicle at one of our locations. We also offer our customers a full-service shop that can provide repair and service on everything from truck and trailer, to personal vehicles, small engines (mowers, boats, ATVs and snowmobiles) and ag machinery. Our large parts and supply inventory allows us to meet any need. In addition, we are an authorized dealer for many brands of trailers and trailer accessories and have partner relationships that can help you find what you need for your operation. When it comes to refined fuels, we help our customers make informed energy decisions carefully sized to their needs. With our state-of-the-industry electronic tank monitoring capability, your fuel tanks can be automatically refilled once they drop below your predetermined level. With our delivery trucks strategically located throughout our trade area and our automated delivery system, you can stay productive and minimize downtime. No more checking tanks or calling in orders. Agtegra proudly sells Cenex® premium diesel fuels. Talk to us about the Cenex Total Protection Plan® (TPP) when you use Cenex Ruby Fieldmaster® premium diesel and Cenex lubricants exclusively and earn up to 10 years or 10,000 hours of engine and transmission coverage. Through a joint venture with North Star Energy, we offer our customers bulk propane, plus a complete line of heating and cooling products and solutions, such as gas furnaces, in-floor heating, geothermal and conventional heat pumps, fireplaces, air conditioners, and traditional and tankless water heaters. Through North Star, we have tank rentals available from 125-gallon to 1,000-gallon tanks. NSE can service large bulk tanks for grain-drying operations and also supply transport loads of propane. The main North Star business office is in Aberdeen and can be contacted at (605) 225-6383. Our service is renowned with our territory stretching north to the Pollock area, west to the Mobridge area, east to the Sisseton area, and south to the Huron/Faulkton area. We also service North Dakota customers. In order to take advantage of our best pricing, bulk delivery can be a key benefit. If you need to install bulk oil tanks, let us know and we will quote you a price for the tank and installation. As production operations change over time, we are often called to assist with moving storage tanks to new, preferred locations. Contact us for more information. Agtegra shop technicians specialize in advanced uptime repair work and service care, ensuring less downtime of your vehicles and equipment. Our industry trained technicians are focused on making an accurate diagnosis and performing effective repairs on a wide range of vehicles and equipment. With more than 200 years of combined repair and service experience, they’re dedicated to getting you out of the shop and back in the field. We offer our customers a variety of billing options to help meet their needs for convenience and affordability. Automated delivery means increased productivity for you. No more checking tanks, calling in orders, or waiting on delivery. Using electronic tank monitoring, fuel tanks will be automatically refilled using our fuel delivery system. When the fuel drops below your predetermined level, the monitor sends a signal to our fuel distribution center. The nearest delivery truck is then routed to your location. It's similar to how you handle your electricity usage. Through consumption billing, you only pay for the fuel you actually use each month. Our growing base of customers who use our automated delivery and consumption billing system say they would never go back to the 'old way' of checking tanks manually and calling in fuel orders. Discounts are based on the total storage volume of the tank, not the volume that was delivered to you. It's another advantage to this system. Using average monthly pricing, the price you pay for fuel is equal to the 30-day average price of fuel for the billing cycle in which you use the fuel. In these times of volatile fuel prices, it's next to impossible to out-guess the market. Average monthly pricing means you don’t have to. If you like the current fuel price, you have the option to buy out the fuel in your tank at any time. Fuel contracts are still available. There is no cost or fees associated with our system. You pay nothing for the monitors. We cover the expense through the money we save by delivering fuel more efficiently.